We arrive at Yoshimitsu (吉光) who is, depending on tradition, seen as student or as son of Kuniyoshi (国吉), his fourth son precisely, taking into consideration his first name Tôshirô (藤四郎) (i.e. the suffix shirô refers to a fourth son). The meikan either date him around Kôan (弘安, 1278-1288) or Shôô (正応, 1288-1293) but there are no date signatures of Yoshimitsu known. We have learned in the last chapter that from Kuniyoshi, blades dated Kenji four (建治, 1278) and Kôan six (弘安, 1283) and ten (1287) are known so both Kôan and Shôô seem perfectly fine for Yoshimitsu, regardless of if he was Kuniyoshi’s son or his student. The Kotô Meizukushi Taizen by the way quotes Yoshimitsu with Kangi one (寛喜, 1229) as year of birth and Shôô four (正応, 1291) as year of death. Before we continue, let me introduce all the (non-Kuniyoshi son) theories that were forwarded over time regarding Yoshimitsu’s background. Some say he was actually the fourth son of Norikuni (則国) and that’s where the first name Tôshirô comes from. Following this approach, he would have been Kuniyoshi’s younger brother, what does not exclude that he rather studied under his older brother than under his father. If we follow the Kotô Meizukushi Taizen, then Yoshimitsu was nine years old when Norikuni died, what would be an explanation for the aforementioned constellation. Incidentally, Kuniyoshi was 24 when Norikuni died but again, the data of the Kotô Meizukushi Taizen is highly doubtful and I don’t want to base too many theories on just that source. All I want to do here is to point out possible scenarios. Others see Yoshimitsu as son of Kuniyasu, others as son of Shintôgo Kunimitsu, and others again as great-grandson of Hisakuni. Anyway, I want to introduce an interesting theory that follows the Kuniyoshi student-approach and that is connected to a highlight of Yoshimitsu, and that is his signature style. This theory says that Yoshimitsu came originally from Echizen province where he lived in the vicinity of the Shiisaki-jinja (椎前神社・志比前神社, present-day city of Tsuruga, Fukui Prefecture). Now Tsuruga is not that far away from the old capital, i.e. about 100 km following the Hokurikudô, and the Hokurikudô was a much frequented route as in Heian and early Kamakura times, Tsuruga had been (apart from Hakata on Kyûshû) the main hub for trade with Song China. The theory also says that he studied calligraphy of the Guzei’in-ryû (弘誓院流) in the capital, a style of shodô that has been established by court noble Kujô Noriie (九条教家, 1194-1255). Taking that into consideration, it is likely that Yoshimitsu has belonged to a rather high-ranking local Tsuruga family and that he moved in higher circles when visiting Kyôto. So maybe he came for something else but had a fondness for swords and was thus introduced to the then most renowned lineage of swordsmiths, the Awataguchi, where he started to study with master Kuniyoshi. I mean, we are talking here about the most prestigious masters of that time who only took orders from the wealthiest clientele, so following the Echizen approach, it is unlikely that for example a peasant boy packed his backback, marched down to Kyôto, and knocked at the door of Kuniyoshi to become his apprentice. Stories like that are more like Edo-era romanticism. As mentioned, this is just one of the numerous theories on the background of Yoshimitsu but reason why I deal with it that persistently is his signature style of which experts agree that the elegant style is not a coincidende and that he must had a decent knowledge of the aesthetics of calligraphy. In other words, Yoshimitsu’s signatures are not just of the “elegant because of the archaic, antique feel” category, like the mei of Heian and early Kamakura-era smiths for example, but are well thought out with all elements like curves of strokes and distance of radicals in perfect harmony. When it comes to Yoshimitsu’s signatures, we basically distinguish between two groups: A more “stiff” and “angular” one that is executed with a somewhat thicker chisel, and a “looser” and more “roundish” one for which a thinner chisel was used. The former features a smaller lower kuchi (口) radical of the character for Yoshi (吉) and is therefore also referred to as koguchi-mei (小口銘), and the latter, with the noticeably larger kuchi radical, as ôguchi-mei (大口銘) respectively. It is assumed that the ôguchi group goes back to his late years. Tanobe sensei introduces a third group which is somewhere in between these two and that mixes certain elements from each group, i.e. that goes back to a transitional time if you want, which he personally thinks of being the most elegant one. Picture 1 below shows one exemplary mei for each group. When it comes to Yoshimitsu’s oeuvre, it is kind of similar to Kuniyoshi, that means, the majority are tantô, followed by a few others and hardly any long swords going round at all, with Yoshimitsu’s long sword body of evidence even weaker than that of Kuniyoshi. And due to the latter fact, I want to “quickly” get by that very limited non-tantô database before we come to the blades we can actually talk about in more detail. Throughout the entire feudal era and up to the 1980s, it was thought that only one long blade of Awataguchi Yoshimitsu exists, namely the meibutsu Ichigo-Hitofuri (一期一振), which was once worn by Toyotomi Hideyoshi. However, Hideyoshi had it shortened from 85.7 to 68.8 cm but ensured that the original signature of Yoshimitsu was set into the new tang as so-called gaku-mei (額銘). When Ôsaka fell in 1615, the blade suffered a fire damage and had to be rehardened by Echizen Yasutsugu. In other words, it is saiha and, apart from old oshigata, we can’t say much about the original interpretation of its yakiba. Pictures of the meibutsu and further info can be found on my Japanese Sword Legends site here and here. Speaking of oshigata, there is a special copy of the work Kôtoku Katana Ezu (光徳刀絵図) that dates to Bunroku three (文禄, 1594) and that shows the Ichigo-Hitofuri before it was shortened. Although the reproduction of the hamon is more or less subject to artistic freedom in such old oshigata collections, I nevertheless want to point out that the ha is obviously more flamboyant than it is the case at Yoshimitsu’s tantô. But this is not as odd as it seems as there is for example the meibutsu tantô Midare-Tôshirô (乱藤四郎) which shows, as the name suggests, a midareba. So Yoshimitsus did work in midareba. Picture 2: Oshigata of the unshortened Ichigo-Hitofuri. In our times, a zaimei wakizashi of Yoshimitsu was “discovered” which had been an heirloom of the Naruse family (成瀬), the daimyô of the Inuyama fief (犬山藩) of Owari province. The blade has a nagasa of 58.3 cm and as its bôhi with tsurebi go way down into the tang and as the signature is placed even below and towards the nakago-jiri, it looks at a glance as if the blade is suriage. But it is not, it is almost ubu (a tiny bit of the original nakago-jiri has been cut off) and was made that way, and with the mei on the omote side, everythong points towards the assumption that this blade was intended as uchigatana. The blade went jûyô in 1991 and was submitted to tokubetsu-jûyô the very next year, which it passed with flying colors of course. This uchigatana has with 2.0 cm quite a deep sori, a toriizori, and ends in a compact chû-kissaki. The jigane is a dense and finely forged itame with plenty of ji-nie and much chikei and the steel is clear and has a “wet” look. The hamon is a ko-nie-laden suguha with a wide nioiguchi mixed with some ko-gunome, ashi, yô, a few sunagashi and kinsuji and shows from the mid blade section upwards some nijûba-style yubashiri. The bôshi is sugu with a little notare and displays a very brief ko-maru-kaeri. So the top quality forging with its abundance of sparkling chikei, the “wet” looking steel, and the classical interpretation in suguha with some nijûba and brightly shining ko-nie lives very much up to the reputation of the Awataguchi school. There are also ken of Yoshimitsu extant, for example the one shown in picture 4 which is designated as kokuhô. It is pretty close to those of his master, or father, Kuniyoshi, i.e. 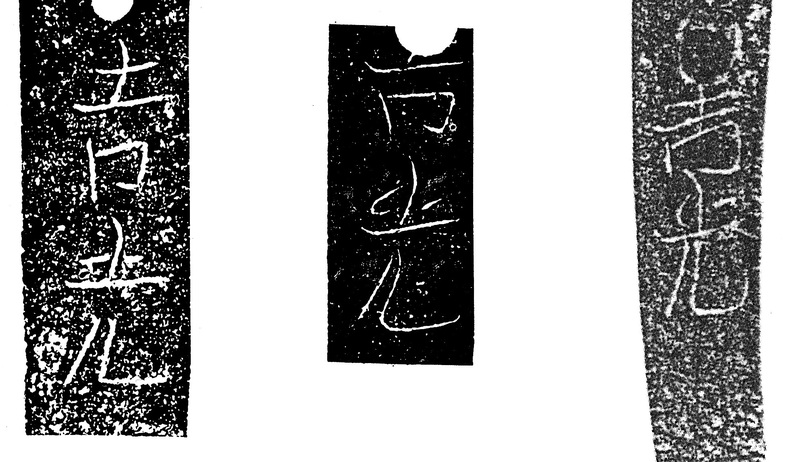 interpreted in ryô-shinogi-zukuri with a central shinogi-hi and a high shinogi, although with a hint more fukura. The kitae is a dense ko-itame with some masame, fine ji-nie, and chikei, and the hamon is a suguha-chô in ko-nie-deki mixed with ko-chôji-ashi, a few sunagashi, and some nijûba on the ura side. The nioiguchi is rather tight and the bôshi shows hakikake. This ken is preserved in the Shirayamahime-jinja (白山比咩神社, Ishikawa Prefecture). And before we go over to the tantô, let me introduce one more of these “other” blades of Yoshimitsu, the meibutsu Honemabi-Tôshirô (骨喰藤四郎, lit. “bone-gnawing Tôshirô”), which is a mumei naginata-naoshi that is designated as jûyô-bunkazai, despite the fact that it is saiha (retempered by the 3rd gen. Yasutsugu after the Great Meireki Fire). In old oshigata collections we see a slanting ko-midare/chôji mix at the base which turns into a calm suguha-chô with ko-ashi. The blade shows prominent horimono of a kurikara and Fudô-Myôô with atop a bonji in a hitsu recess. On the basis of the tang it is speculated that the blade had been mumei from the beginning, that means, even if the naginata – it was once a smaller-sized ko-naginata – was shortened to wakizashi/uchigatana length, the signature would have been at a higher position anyway and would not have been affected by the shortening. The attribution to Awataguchi Yoshimitsu goes back to the Hon’ami family and the jûyô-bunkazai designation – which says “Den” Awataguchi Yoshimitsu by the way – reflects more the historical value and provenance of the blade, which is as mentioned shortened, unsigned, and saiha. Now to Yoshimitsu’s tantô. Many experts see him as best tantô smiths of all times, standing on top of the winners’ rostrum with Shintôgo Kunimitsu. On top of that, he is counted with Masamune and Gô Yoshihiro to the so-called sansaku (三作), a term that was coined in the Edo period and which means about “Best Three Smiths of All Times.” With 16 listed blade, he also ranks, from a quantitative point of view, number three in the Kyôhô Meibutsu Chô, only “beaten” by Masamune with 39, and Sadamune with 19 blades. Incidentally, 18 blades of him are found in the yakemi section of the Kyôhô Meibutsu Chô. As comparison, the publication lists the same number of yakemi by Masamune and eleven of Gô Yoshihiro. When we get a quick overview of Yoshimitsu’s tantô, we learn that things are not that much different than with Kuniyoshi. That is, he made tantô in a great variety of shapes, e.g. 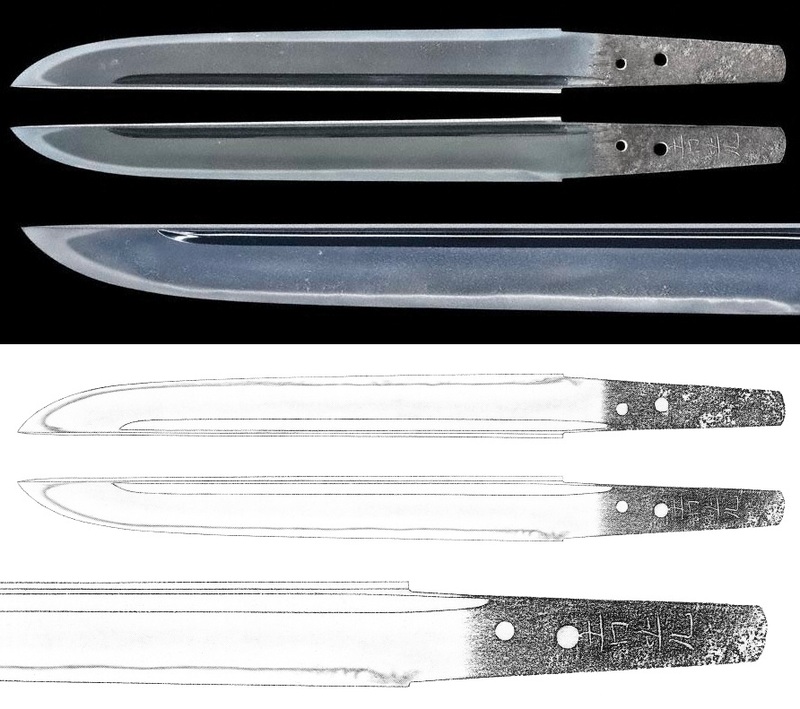 standard ones, smaller and wider hôchô-style blades, long and thin, and long and wide tantô which feature a sunnobi-sugata. Also the way grooves are added is very similar to Kuniyoshi and when we remember that Kuniyoshi worked up to Kôan (弘安, 1278-1288) and Yoshimitsu is traditionally dated around Kôan and the subsequent Shôô era (正応, 1288-1293), we realize that this dating is – despite of the fact that as mentioned no date signatures of Yoshimitsu are extant – quite senstive. In other words, the interpretation of extant works corroberates that Yoshimitsu’s active period has been pretty close to that of Kuniyoshi what allows us to speculate that he indeed might has been his younger brother rather than his son as for a son, we would expect a hint later nengô like for example Einin (永仁, 1293-1299) or Shôan (正安, 1299-1302), which in turn means leaving late Kamakura and entering the final years of this period. 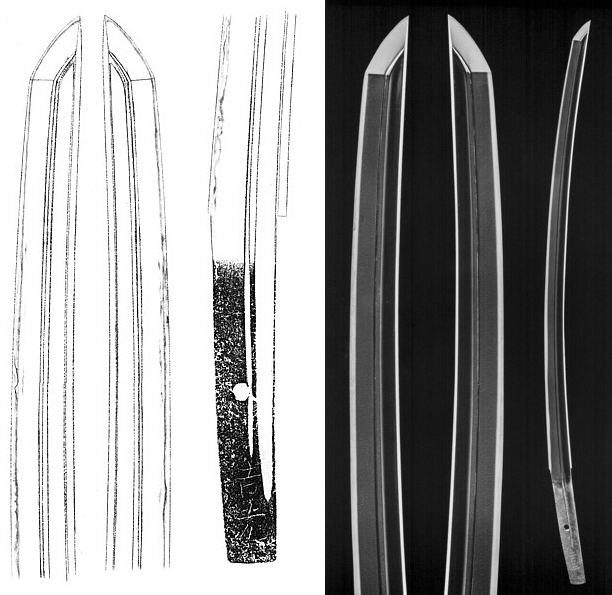 Anyway, regardless of the sugata of tantô, we see characteristic features that appear on the majority of blades from that category and which can be described as follows: Small connected gunome elements or at least gunome-ashi at the yakidashi which make that area look like small strung together beans. Sometimes also an approach or even a solid koshiba might be seen. Nijûba or nijûba-like yubashiri appear parallel to the habuchi, but not as obvious and not all over the blade it is the case at Kuniyoshi. The ha often gets somewhat wider, and/or thins a little out before it enters the bôshi. This feature can be pretty obvious and appear as a true bend, or might just as a bend by a slightly thinnig or slightly widening ha at the point where the bôshi starts. In addition, the nie are much more emphasized in the bôshi and appear there often as if they “spill” in a frayed manner into the ji, a feature that is referred to as nie no kui-sagari (沸の喰い下がり). Please note that there is some confusion with the term okina no hige (翁の髭, lit. “beard of an old man”). This term too refers to increasing nie in the bôshi but is reserved for Shintôgo Kunimitsu. Basic difference is that okina no hige are super fine kinsuji within the ha that remind – due to the fact that they follow the underlying hada which tends at Shintôgo somewhat to nagare in that area – of the long beard of an old man. They might reach into the ji too in certain cases but focus as mentioned more on the ha whereas at Awataguchi Yoshimitsu, the nie-hataraki take much more place in the ji than in the ha. So before we continue, let me summarize the characteristic feature of Yoshimitsu in picture 6 below. Picture 6: Characteristic features of Awataguchi Yoshimitsu’s workmanship. In the following I would like to introduce some representative tantô of Yoshimitsu (going from small to large) and, if you have time, I recommend going back one chapter, comparing them to the works of Kuniyoshi. You will see the similarities. First a blade that is designated as jûyô-bijutsuhin and that is one of the smallest tantô known by Yoshimitsu. It has a nagasa of 21.5 cm, uchizori, and because of its proportions, everything points towards late Kamakura. It shows a fine and uniformly forged ko-itame which shows ji-nie. The hamon is a hoso-suguha with some ko-gunome at the base and narrows a little towards the monouchi before it gets again wider in the bôshi. In addition, we see faint nijûba and nie that get stronger in the bôshi and appear there as nie no kui-sagari. So we have pretty obviously all characteristic features of this smith present on this blade. Next a blade that is a little uncommon, namely in the way that it is a yoroidôshi-style tantô, featuring a moto-kasane of 1.05 cm. Accordingly, the tantô got the nickname Atsushi-Tôshirô (厚藤四郎, lit. “The Thick Tôshirô,” sometimes also read Atsu-Tôshirô). The blade is designated as kokuhô and shows a somewhat standing-out itame with plenty of ji-nie and much chikei. The ko-nie-laden hamon starts with some ko-notare and gunome at the base and turns then into a suguha which is mixed with some kinsuji and with plenty of ashi an yô. The bôshi has a ko-maru-kaeri and shows hakikake. 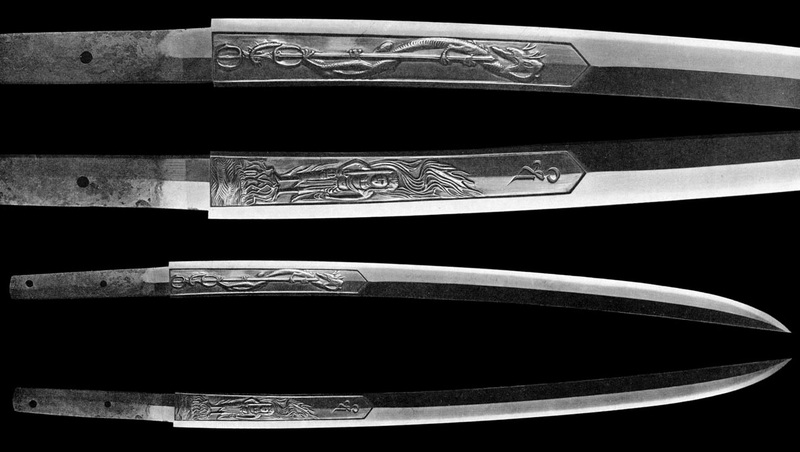 As mentioned, Yoshimitsu also made some wide and stout hôchô-style blades like the one shown in picture 9 which bears the nickname Hôchô-Tôshirô (包丁藤四郎) accordingly. Please note that there is another meibutsu with that name but which was damaged by fire during the Great Meireki Fire of 1657. The one introduced here is designated as jûyô-bijutsuhin, shows a very dense and beautifully forged ko-itame with plenty of ji-nie, and also displays a slanting bô-utsuri at where the hamon starts and a nie-utsuri all over the blade. A faint nie-utsuri is also seen on the tantô shown in picture 7. The hamon of the Hôchô-Tôshirô is a ko-nie-laden chû-suguha-chô with a bright and clear nioiguchi and is mixed with ko-gunome, some ko-notare, ko-ashi, and yô. The bôshi features a somewhat “tied-up” ko-maru-kaeri. 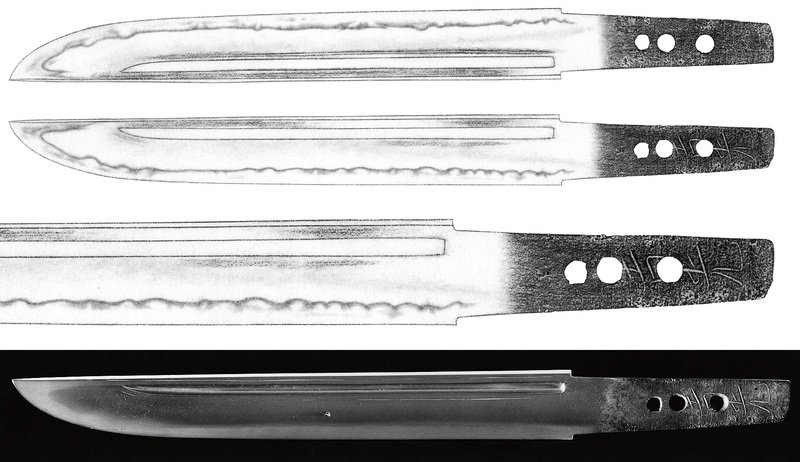 The blade shows a pretty conspicuous amount of midare and please note the hi which is in Awataguchi-typical manner engraved close to the mune (although here with traces of a thin tsurebi that went all around the groove). Picture 10 shows another wide blade that tends to hôchô. It was a heirloom of the Tachibana family (立花), the daimyô of the Yanagawa fief (柳川藩) of Chikugo proince, and is today designated as kokuhô. The blade is as mentioned wide, has a nagasa of 23.1 cm, and shows a dense and beautifully forged ko-itame with plenty of ji-nie, rather thick chikei, and a straight nie-utsuri. The hamon is a ko-nie-laden chû-suguha that features a bright nioiguchi, a few ko-ashi, and some connected ko-gunome at the base (more prominent on the omote side). The bôshi appears as sugu with a ko-maru-kaeri and brief hakikake and again, we see a hi that is engraved extremely close to the mune. And last but not least, I want to introduce one of Yoshimitsu’s most famous (some say his best) and largest tantô, the meibutsu Hirano-Tôshirô (平野藤四郎). It has a nagasa of 30.1 cm, a rather wide mihaba of 2.8 cm, and also quite a thick kasane of 0.8 cm. It shows a very dense ko-itame with a hint of masame towards the mune and plenty of fine ji-nie. The hamon is a suguha in ko-nie-deki that starts with some connected ko-gunome and that is mixed with shallow notare, a little gunome-midare, ko-ashi and yô. Both nioiguchi and ha are bright and clear and the bôshi is a shallow notare-komi with a ko-maru-kaeri. To round this chapter off, let me address some essential kantei points. As we find ourselves in the late Kamakura period, we are dealing with the finest, most elegant, and qualitative best tantô ever made and are facing the greatest tantô smiths of all times, which were Awataguchi Kuniyoshi, Awataguchi Yoshimitsu, Shintôgo Kunimitsu, and Rai Kunitoshi. All of them made tantô with various sugata, so it is difficult to jump to a conclusion right away based on the shape alone. But what we can say is that tantô of Shintôgo Kunimitsu and Rai Kunitoshi show by trend a little thinner kasane as they were active later and approached Nanbokuchô. But if present, hi are a good hint because if they are noticeably close to the mune, it is very likely that you have an Awataguchi work. 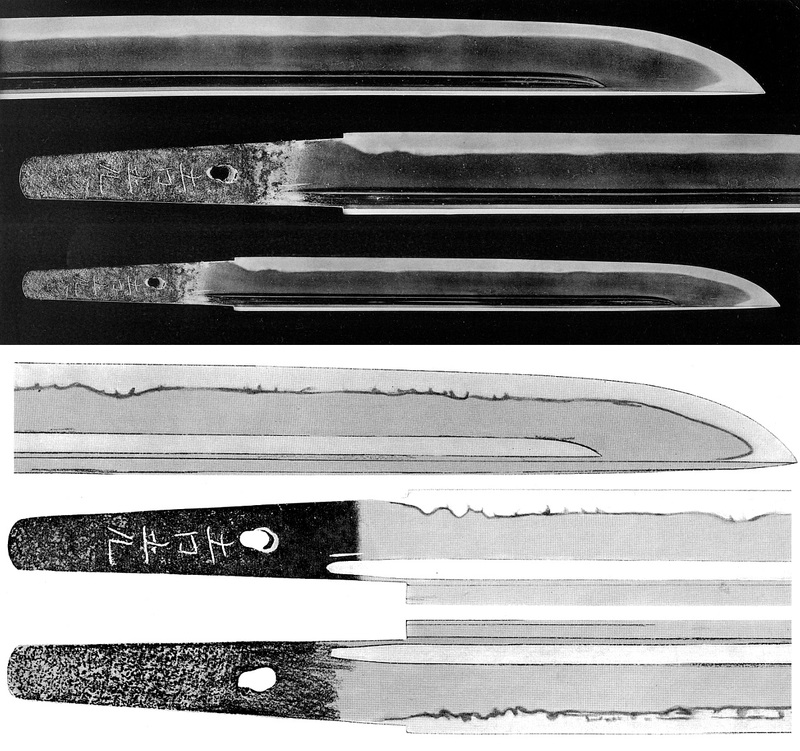 When it comes to the jiba, the blades of Shintôgo feature more chikei and kinsuji and are overall more nie-laden than those of Yoshimitsu. In other words, his jigane is stronger and with Shintôgo Kunimitsu, we can feel a moving away from Kyô and towards the soon to be established Sôshû tradition. At Rai Kunitoshi in turn, the nie are somewhat more calm, that means, the emphasis on nie goes in ascending order: Rai Kunitoshi → Awataguchi Yoshimitsu → Shintôgo Kunimitsu. I have already mentioned that Yoshimitsu’s tantô are quite similar to those of Kuniyoshi, with the difference that Kuniyoshi’s ko-itame is a hint denser and a hint more uniform and appears a hint more often as “straightforward” nashiji-hada. Apart from that, there is much more nijûba and the nie would not increase in the bôshi. And when you see prominent ko-gunome at the base or some kind of koshiba, it is safe to go for Yoshimitsu, supposing that you have narrowed down a bid to Kuniyoshi and Yoshimitsu. As indicated in the last chapter, there are some tantô of Kuniyoshi which too show an approach of this feature at the base but it was Yoshimitsu who so to speak applied it “fully”.